Servo motors from the radio control world are becoming popular to operate model railroad turnouts. The 9 gram sized servos are the popular size for this, with enough power and a great price point. Mounting the little servos is one of the trickiest parts of using them to run your railroad. Our innovative well mount “Manhole” style servo mounts let you install typical 9 gram servos just below the layout surface hidden by scenery. Great for use with any scale. Our well mount holds the servo securely and a matching lid makes a flat surface easy to cover with scenic materials. 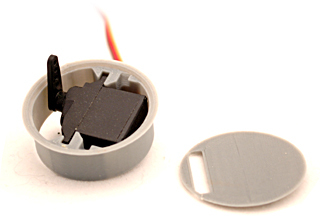 These mounts make quick work of installing your servos with only a tiny crank arm visible. Recently we’ve changed our servo stock to the Tower Pro MG90 motors with metal gears. We’ve updated our well mounts, adding 1/8″ to the diameter to accommodate the slightly taller servos. These well mounts work fine with the MG90, as well as the Tower pro SG90 or Solar A10 models. 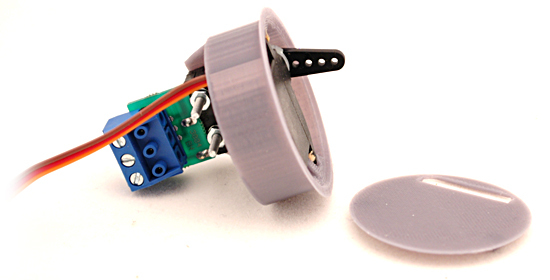 Our mounts do not include Servo Motors. See our Servo Motors here or use your own. Installation can be performed from above the layout with only a drill and 1-3/4″ spade bit or hole saw. No need to work under the table except to connect the servo plug-in wiring connections. Great for thin shelf layouts too, with only about 3/4″ thickness from the layout surface. Our open bottom design prevents ballast and scenic materials from accumulating and fouling the mechanism. Our latest addition includes a 5 amp SPDT micro-switch to power frogs, operate signals, or provide system feedback. The screw terminal block can accept up to #14 wire and is removable from the unit to help make wiring easier, separate from the servo mount! Check out our Servo Under Table Mount for a different type of servo mount, completely hidden mounting below the table. Order any of our mounts one at a time or in a discounted 4 pack. These mounts are perfect mates to our Servo and Servo Control Base. Our mounts do not include Servo Motors. Important Note: Servo motors MUST be operated by an electronic control signal (DC alone won’t do it). Servos can be easily controlled with our Servo Control Base, Tam Valley Depot systems, and others. Legal stuff: The switching version of this product contains chemicals known to the state of California to cause cancer (lead). Unused or retired products should be recycled properly or may be returned to Berrett Hill for disposal in accordance with RoHS standards.